If you invest a significant amount of money to purchase an RV (recreational vehicle) you would expect certain things from it. Probably the first thought that comes in your mind is space and comfort, the second might be its engine performance and all other technical aspects. The color of your RV’s exterior is probably the last thought that strikes your mind. However, for some people, it is all about the look. And that’s not a problem, you want your RV to look great. If you don’t like your new RV’s paint because that particular shade might have been in trend at any time, but no longer is in fashion and wish to give it a new personalized touch. Or if your RV’s paint has worn-out over the years, you need not worry. Whatever be the reason, you can always give your RV a new look altogether. Fortunately, the market has everything that you would need to paint your RV exterior. From paints to waxes, palm sander to painter’s tape, everything is available easily and you need not to worry about sending your RV to a workshop as you can do it by yourself and the good thing is that it’s a fun process. Before starting to paint, ensure that you have standard quality fiberglass paint. Specialist fiberglass paint not only costs more, but it will also leave a better and more professional finish. Fiberglass paints are available in matt, gloss and high-gloss finish to choose from. Paints that contain acrylic, polyester, polyurethane or epoxy are considered better as they give a firm, all-weather resistant finish. Just ensure that it does not contain melamine or oil. How To Paint Your RV Exterior Fiberglass? 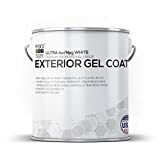 PROVIDES THE BEST Gel Top Coat UV Paint Protective Layer for yachts, swimming pools, sanitary ware, sinks, commercial and recreational vehicles and many more uses! ISO/NPG Base offers 60% less shrinkage, Low-VOC with less overspray, and up to 200% better gloss retention than conventional gel coats! First, park your RV in a shady and well-ventilated space like your driveway or garage. Then, collect all essentials required like palm sander, fine grit sandpaper, denatured alcohol, a soft cotton cloth, detergent or soap water, painter’s tape. Clean the entire outer surface of the RV which can be done using simple detergent/soap – water with an automotive-sponge to get rid of all adhering dust, grime, mud, and bird- droppings from the surface of your RV. A ladder can be used to reach difficult areas and the rooftop. The Motorhome’s fiberglass should be roughened-up to make it capable of accepting and absorbing the primer coat and paint. This roughening can be achieved with the help of wet sandpaper with fine grit. Don’t spend too much time at a single spot as it can lead to uneven final results. This whole process should get completed in an hour or so. Wipe off the whole sanded surface using denatured alcohol with a rag to remove the remaining (if any) grease after washing with detergent water. Protect the not-to-be-painted areas: Cover the areas like knobs, windshields, mirrors and window panes with heavy paper and painter’s tape. Before starting the painting steps, keep latex-based primer, fiberglass paint, a paint-gun, and acetone handy. Painting job is not as simple as it might seem to be. One needs to be very careful and patient while tackling paint brush or paint-gun. If you are not familiar with handling a paint-gun, you can choose hand-painting. However, hand-painting is a very slow process and may not give a smooth and even finish. The faster alternative is a Paint-gun. It not only takes less time but also gives a nice and professional-like finish. You can buy or even rent it and experiment with it before applying it directly to your RV. Once you get comfortable with handling it, the task becomes quite easy. Clean the inner part of the paint-gun using a soft cotton cloth soaked in acetone to ensure no remnants of paint used in previous painting jobs are present in it, as the paint remnants may ruin the paint to be used this time. Prepare the required shade of paint following directions given in the user manual provided along with the package. Apply a single coat of primer on the exterior surface of RV to make the paint adhere the fiberglass firmly. Fill the mixture in paint-gun and start applying long and even strokes of paint. This task needs to be done very carefully in order to avoid any drips or runs. It is advised to start from the front part of the RV and moving backward. This helps in getting an even appearance. Leave the RV to dry the gel-coat for 24 Hrs. Apply the second coat the next day in the same manner as before. Examine that entire fiberglass surface is evenly covered and no area is left behind and if any unevenly painted area is spotted, clean it using sandpaper and paint it again. Once you are done with painting, a final step to make your RV look as fantastic as new remains. All you will need is an RV wax and a soft cotton cloth. Apply a coating of RV wax with the help of soft cotton cloth in circular motions. This coating provides protection to the paint coat and also gives a shining appearance. The heavy paper and painters tape can be removed now taking care that it doesn’t peel off paint coat with it. Painting your RV not just gives it a new look, but also extends its life. What seemed to be a herculean task to tackle in the beginning can be achieved easily by breaking the process in small steps and being prepared with all required equipment. Now, that you have got a look you wanted for your RV, the task is not over, you need to take good care of your motor-van to make the paint last longer and it continues to give you recreational vacations for long. Just the way you invest your time in keeping your RV’s interior neat and organized, you need to give equal attention to the exteriors as well. Always park your RV under a shade to protect it against UV rays, wash it regularly to get rid-off dirt and bird-droppings and drive carefully preventing any scratches or dents. Take care of your RV and it will pay you back in terms of relaxing fun-vacations.